Welcome back! If you’ve followed this program from the start, you come prepared for our five exercise, Extended Legs Back Roll – great job! You need to tread carefully on this one if you are not an athlete, and only after you’ve perfected the technique of the previous four exercises. Repeat 6 times overall, 3 per variant. Taking the hips off the floor in the 3rd phase, press down hands firmly on the mat as the arm extensor muscles in the shoulder joint also help to raise the torso. In the 5th phase the arms are in the same position and also play an important role. It is important to start the movement from the pelvis to consistently bend the spine in the lumbar region, vertebrae by vertebrae. The muscles of the abdomen will tilt the pelvis backward. Posterior pelvic tilt activates more muscle fibers in the lower abdominal muscles and thus contributes to the stability of the center. In addition, the Extended Legs Back Roll does a good dynamic stretching of the hip and back muscles. 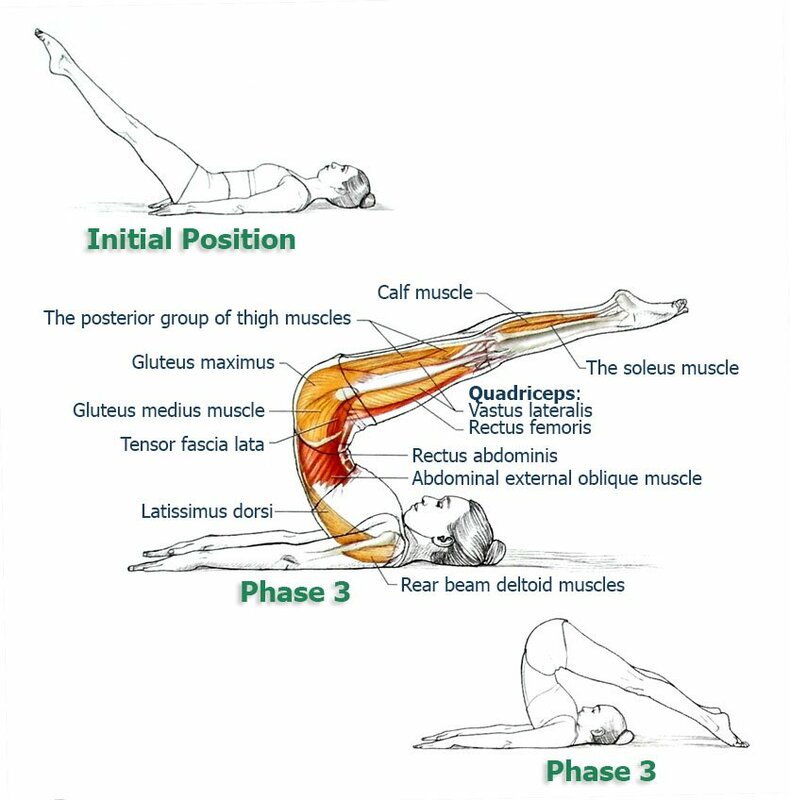 Despite the undeniable benefits of this exercise, a forced flexion of the spine in the thoracic and cervical region occurs under the influence of gravity. This is not always acceptable and valid for all individuals. Do this exercise only if you do not feel discomfort in the back and neck. Consult with your doctor and if necessary give up the exercise, or make appropriate modifications. In the 3rd and 4th phases of the exercise, extend the legs behind the head only as long as the weight falls on the shoulders and upper back, and not the neck. This will reduce the load on the cervical vertebrae. If you are missing some flexibility, in the beginning it is enough to keep your feet parallel to the floor. Touch of the mat is optional. If this is also difficult, you can additionally slightly bend the knees when they are over your head. If a tightness of muscles in the lower back or shoulders does not allow to raise the hips above the shoulders, bend your elbows and place your hands on your lower back to create support for the body.